About six weeks ago we were visiting the vicar to talk about our wedding plans for next year. The conversation ended up with him telling us about his brother Rob, who lived a self-sufficient lifestyle in a caravan in a field, and grew his own food. After I said that sounded awesome, he told us about Rob’s YouTube channel, Rob’s Discovery. Obviously I went home and straight away found his videos, which were really interesting. In one of these videos, Rob made his own batch of kombucha for the first time and was describing the process and showing the results. As a curious person who loves all things unusual and weird, this immediately piqued my interest. I set about learning what kombucha is and how it’s made. Kombucha is a pale orange coloured probiotic drink that’s made from fermented tea. It has a sweet taste with a slight sour tang on the end, and is usually carbonated. 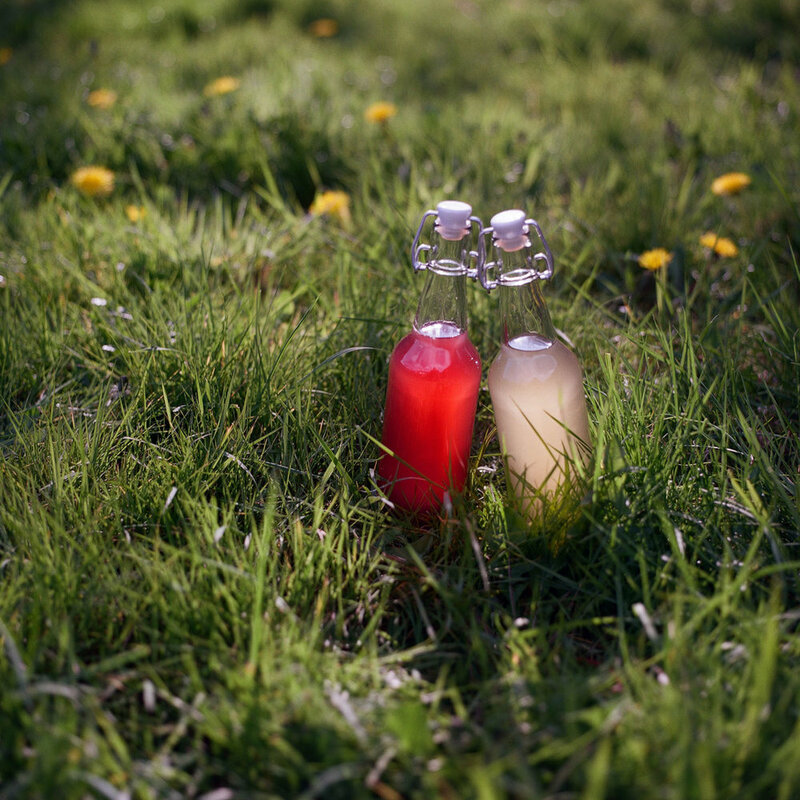 “Plain” kombucha is a common flavour, but fruit and herbs are often used to create a variety of flavours. Turns out it’s super simple to make too! Essentially, you fill a container with cooled sweet tea, and yeast and bacteria ferment the liquid and turn it into kombucha. The process only takes between one and two weeks so it’s common to have batches constantly on the go in the cupboard. The only tricky bit is the yeast and bacteria, which are in the form of a gross looking off-white rubbery layer called a SCOBY (symbiotic culture of bacteria and yeast). The SCOBY is the most important part of the process, and the same one is typically used for each batch, transferring it between the finished drink and the new batch. I didn’t want to simply buy a SCOBY off the internet, as I wanted to see what it’s like to grow my own. I bought a small bottle of organic and unpasteurised kombucha (it was quite tricky to find, I ended up getting it from Holland and Barrett) and added this to a large container of sweet green tea that had cooled to room temperature. The bacteria and yeast that are in the kombucha then ferment the tea solution and grow to be a full sized SCOBY in a process that takes about a month. After the SCOBY has grown to ¼ to ½ inch thick, you can transfer it to a fresh container of tea and it will happily ferment away over about a week, ending up with a pale orange liquid that’s sweet with a slight sour tang at the end. Then, to get it nice and bubbly, you put it into smaller sealed bottles and over the next couple of days it will continue to ferment and the carbon dioxide it produces in the confined space will be forced into the drink, carbonating it. It’s during this secondary fermentation that you can also add fruits, syrups and herbs for flavour. I decided to make one plain kombucha so I could see what it tastes like naturally, and then one cherry flavoured one using defrosted frozen cherries that I’ve had in the back of the freezer for the last year. The taste is indeed quite sweet with a sharp tang, but it’s definitely interesting. I’m part way through the secondary fermentation at the moment and I’m really looking forward to seeing how it tastes ones it’s finished. I made just under a litre and a half of kombucha which gave me two 500ml bottles with a bit left over to kick start the next batch. Comments are welcome as usual, and if you’re a seasoned Kombucha maker with some tips for success, that’s even better!